The Vice President, M. Venkaiah Naidu addressing the gathering at the GRIDTECH 2019 in New Delhi on 3 April 2019. The Vice President, M. Venkaiah Naidu, has called for the promotion of new and renewable energy in a big way, not just to ensure energy security but also protect the climate and reduce pollution. “Adequate growth in renewable energy would serve dual purpose – firstly, it would contribute towards achieving energy security to the nation and it would address the environmental concerns, which need to be tackled on a war-footing,” he said. 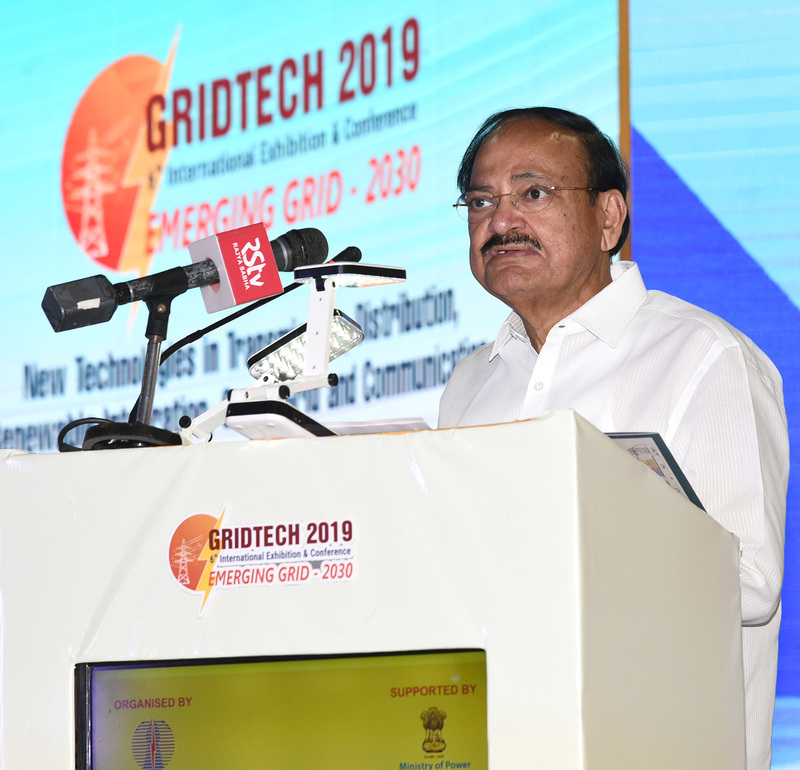 The Vice President was addressing gathering after inaugurating the GRIDTECH 2019, an International Exhibition and Conference, organised by the Power Grid Corporation of India Limited in New Delhi on 3 April 2019. He has asked experts to find out new technologies to harness renewable energy to fulfill India’s energy demands and fulfill the country’s international commitment to de-carbonize the electricity generation. Naidu also called for the promotion of clean and green mode of transport, such as Electrical Vehicles (EVs) on a large scale, pointing out the potential to save foreign exchange on crude oil import apart from reducing carbon emissions. He also called for inclusion of renewable energy provisions right from the planning of towns. Opining that rapid urbanization led to increased energy demand and rise of Green House Gas (GHG) emissions, Naidu urged technologists to find new methods for tapping the huge potential in the renewable energy sector. He also wanted them to educate the common man on the need to cut down GHG emissions. Pointing that connectivity and electricity were key to development, Naidu stressed upon the need to address challenges such as pilferages in transmission and distribution.